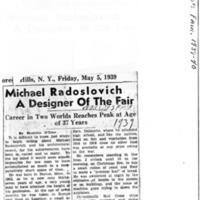 Michael Radoslovich was by 1939 a famous and well-respected architect, most well-known for his design of the East River Drive, known today as the FDR Drive in Manhattan. Originally from Boston, he relocated to Forest Hills, Queens, a stone's throw away from the fairgrounds. His works reshaped the area forever. 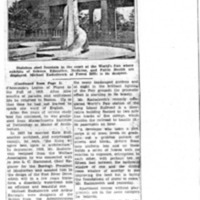 As seen in the newspaper clippings above, he was responsible for the construction of the pedestrian overpass from the Administration building to the World's Fair Amusement Grounds and the stainless steel fountain outside of the Halls of Science, Education, Medicine and Public Health. He also contributed to the transportation system for the fair, constructing the Long Island Railroad station nearby which boasted the capability of transporting "18,000 passengers an hour."